Our Creative Marketing Team has scoured the digital marketing realm to bring you our top inspirational picks for the month of November. These prime examples will help get the creative juices flowing when it comes time to create your next digital marketing campaign. This month’s post is jam-packed with video examples. While we didn’t plan for this to happen, it speaks volume to the impact that great video production has on consumer audiences (and apparently marketing teams) today. Let’s start the feature presentation. Whether for remarkable relevancy, rollicking randomness, amusing absurdity, or earnest emotion – here are four video advertisements that caught our eye this month. This Tide commercial is part of a football-focused campaign that brings marketing relevancy and timeliness to a whole new level. The TV ads, which have been airing during Thursday Night Football games, instantly grab the attention of viewers by making them feel like the commercial break is over. Tide strategically created each commercial so that the announcers and the football teams seen in the ad are the exact same ones as the actual game that is airing that night. This tactic, combined with the way they humorously tie their product to the football theme, forces audiences to engage with their product in a fun way that also makes sense. Old Spice is now known as one of the most successful re-branding examples ever. And, as bizarre as they are, commercials like the one below are the main reason why. In an effort to attract younger male audiences, Old Spice started creating ads that showed they didn’t take themselves too seriously. This was essentially the exact opposite of the older, more serious audience they had previously engaged with. By branding their product with current cultural currency like the word “Swagger,” Old Spice was able to pull off an astonishingly successful transformation that is sure to keep them relevant for years to come. This next digital marketing example is viral video marketing at its best. By using animation and a script packed with tweetable words like “win-win”, they are able to create a bizarre scenario that no one could have anticipated, but everyone wants to see. The ad, which has been on YouTube for only a month now, is about to reach 2 million views. When do you know your commercial is working? When you don’t even have to pay for ad-time because so many people are actively searching for it and sharing it. In most films, the use of typography is limited to opening credits, title, and closing credits. But, here’s an example of a movie that ignores that tradition. Zombieland is a film that fuses action-packed imagery with static on-screen text in order to add a unique layer to the storyline. Obviously, this isn’t appropriate for all movies but, in this case, it works. The text is short and follows the same theme of being numbered “rules” that makes it easily digestible. Plus, if the text was not on screen, there would have to be a narrator announcing the rules, and that would certainly take away from the gripping action-packed scenes. If your business is one that utilizes product catalogs, you’ll want to see this. 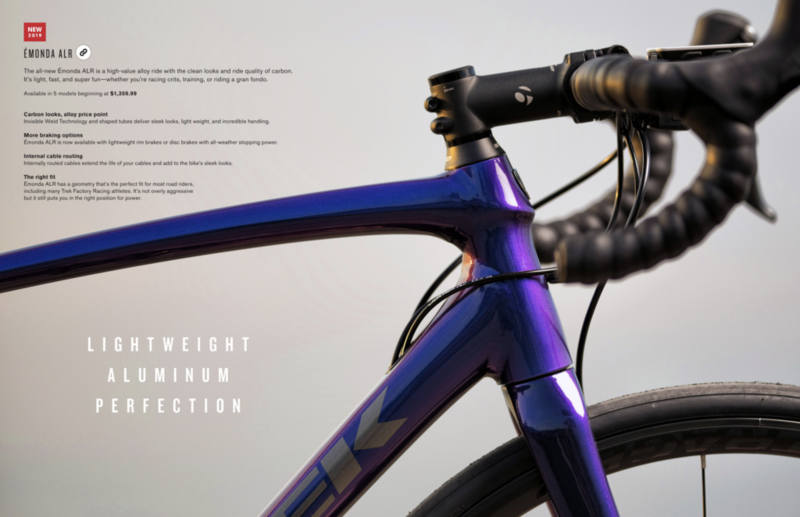 Trek’s digital catalog, which can be emailed out to subscribers or shared as a link, is a shining example of what exceptional catalog design, copywriting, and functionality looks like. The product shots are nothing short of beautiful, and each page is meticulously designed with a unique color scheme and a headline that allows the product to shine. Plus, each product in the catalog is linked directly to the website where the item can be purchased. Do you have any digital marketing examples that set the bar for you? Share them in the comments below to spread the inspiration.